On Friday 4 November 2016, the library at the Asia House was packed for our Beyond the Rocks: Asia and Contemporary Jewellery talk. Leading studio jewellery specialist Miranda Rhys Williams from Tyger Glyn Gallery addressed key contemporary art jewellers who draw inspiration from Asia, particularly India, China, Japan and a bit of Korea! The talk included the artists/makers, Poppy Dandiya, Flora Bhattachary, Alice Cicolini, Nora Fok, Nan Nan Liu, Mariko Sumioka, Kayo Saito and Catherine Martin. There was also an opportunity to see some of this stunning jewellery in the flesh. Miranda looked at the correlation between jewellery design in the East and West and how they have been inspired by each other. She looked at the orient’s creative influence on the West in the 19th century and how Asian designers looked to Western jewellery styles such as developing the brooch. The talk summarised various strands of contemporary jewellery from fine, to commercial to art and studio jewellery. Our talk focused more on the latter, which as Damian Skinner explains in Contemporary Jewelry In Perspective, ‘frees jewellery from the restrictive ideas that its value was tied to the precious materials from which it was made’, allowing ‘jewellery to become a form of artistic expression’. Miranda began with jewellers influenced by Indian arts and practices. She examined Poppy Dandiya, who merges Western design and ancient Indian heritage and Flora Bhattachary, who draws on her family’s Indian roots and combines jewellery making techniques with traditional Indian practices. Miranda also addressed Alice Cicolini who is influenced by the patterns and traditions of the Silk Road. In works such as Double Temple Necklace, Alice draws on Indian sacred architecture but also Chinese symbolism using red silk. Alice’s Jodhpur Miniature Leaf Ring (see here) is inspired by a piece in the HRH Maharaja of Jodhpur’s private miniature collection. For China, a key figure was Hong Kong born, UK based Nora Fok, one of the most conceptual of the jewellers raised in the talk. Her experimental creations in nylon such as Princess Pagoda, inspired by Kew Gardens’ dominating symbol of Chinese culture, are like works of art. Miranda likened Nora Fok’s work, The Future is at our Fingertips, to the ancient Chinese tradition of fingernail guards. The stunning natural works of Nan Nan Liu which are made from silver and paper, were compared to Chinese rice fields. For Japan, Miranda explored the mokume gane pieces of Craig Stuart, the organic works of Kayo Saito, the stunning designs of Catherine Martin and the striking sculptural work of Mariko Sumioka. Mariko, born in Japan but grew up in Brazil, reflects in her work a nostalgia for her home country, using its traditional techniques and drawing from its architecture in works in bamboo. Her piece, Pray for Kumamoto was created in commemoration of the city’s earthquake and its structure reassembles prayer trees and uses coral thread from old kimonos. Catherine Martin on the other hand, is the only person to use the traditional Japanese textile art of Kumihimo in metal. Miranda explained how the traditional technique is normally used to braid strands of silk and the Samurai used the art as laces for their armour. Catherine, as Clare Philips explains in Jewels and Jewellery, learnt this classical style of ‘braiding at the Domyo School of Kumihimo and some years later went to the Royal College of Art to study jewellery’. Her work ‘Circle of Flames’ (see here) is a stunning example of this technique in platinum and gold. The talk posed interesting questions like, what is contemporary jewellery? What makes this jewellery appear Asian? Miranda went ‘Beyond the Rocks’, looking at the role of design over precious gems, asking will jewellery as art ever replace our love affair for precious rocks? 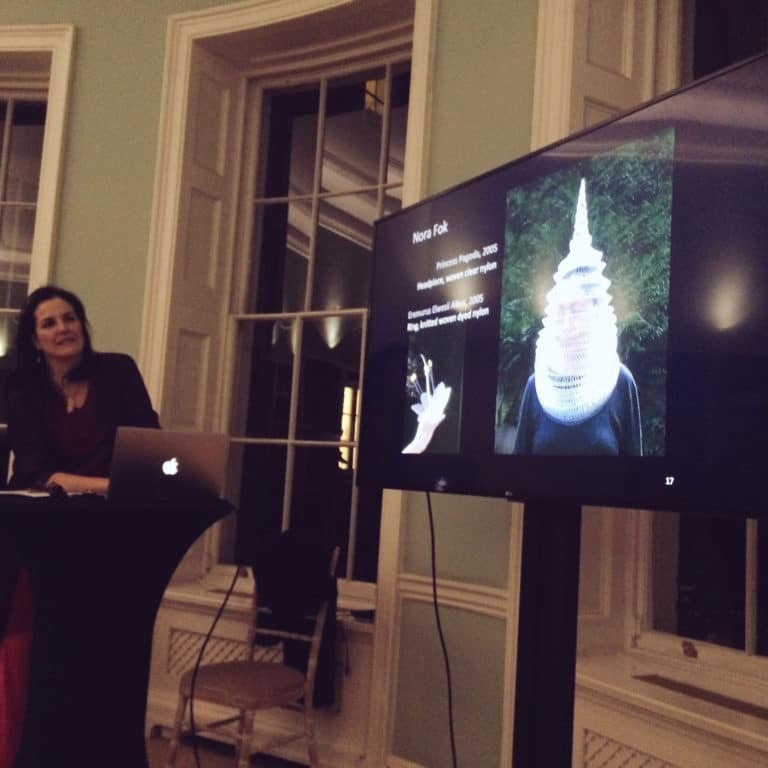 This talk was part of Asian Art in London, a ten day event that brings together over sixty of the world’s top dealers, major auction houses and museums for an annual ten-day celebration of the finest Asian art.